It’s one thing to adopt an agile management style but it’s quite another thing to understand why your organization is going agile. All too often the agile management process breaks down in organizations because people simply don’t understand the benefits of agile. As you know agile management is based on the Agile Manifesto and Agile Principles, which includes a focus on the individual, the ability to adapt or change, a focus on customer needs, and a commitment to simplicity and quality. This approach to managing projects, teams, and customer deliverables demands highly cross-functional teams who are able to communicate easily, adapt to change quickly and are willing to think beyond the immediate. Teams work in short sprints or iterations (typically two to three weeks) to complete a designated number of stories. At the end of the sprint or iteration, all of the given project work is expected to be completed and in a state that it could be demonstrated or sold to the customer. By keeping the development and production cycle short, teams are better able to stay focused on producing a high-quality deliverable that is free of bugs or other errors that require constant updates. Team members are fully invested in the stories in the given iteration or sprint and work together to support one another through development, testing, documenting, and completing the story. It is only when one story is completed that team members move on to the next story, preventing multiple streams of development from ending up in an incomplete state. All of this contributes to a highly dynamic, communicating, and collaborative team environment, fostering greater team cohesiveness and overall commitment to the organization goals. The extra bonus and major plus behind agile management is that these small cross-functional teams are able to adapt and respond to change very quickly. Problems and blockers are no longer insurmountable or catastrophic, the Scrum Master or product manager knows that the team is able to quickly switch focus to dealing with the problem-at-hand or for example responding to an immediate customer request. The agile management methodology is designed to be whatever it needs to be for your organization. The way you do agile may be completely different from your competitor and this is okay – the goal is to create an adaptive, communicating, and collaborative work environment that ensures customers receive quality products quickly and easily. When discussing agile management with your teams or with upper management, remind them of these key benefits of agile management. Ask your teams and upper management if the organization can afford to miss out on these key benefits. Emphasis on product quality. No team or organization wants to deliver a sub-par product and with agile management, the focus is squarely on delivering a quality product. Due to the iterative nature of agile, testing, refining, and updating the product happens in conjunction with development and production. 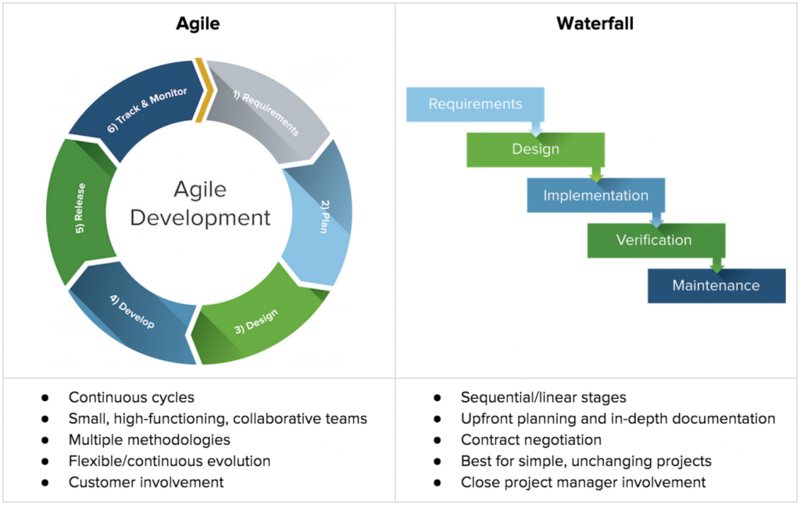 This happens in agile software development and in any enterprise such as manufacturing, automotive, or consumer goods that is using agile methodologies and principles. Enhanced customer satisfaction. This occurs in tandem with delivering high product quality. The very essence of agile management allows for teams to quickly respond to customer needs, delivering the exact product or feature as requested by the customer. The turn-around on product delivery is faster, reducing product wait times for the customer. Better project management. The traditional waterfall methods of management often resulted in six-month development cycles, making it challenging for project and product managers to realize a successful product. With short sprints or iterations, project and product managers know exactly what is going on, can easily communicate with team members, and can keep customers updated with product developments. Lower risks. Problems, errors, or blockers are quickly identified thanks to the iterative testing that occurs in tandem with development. The surprise factor of a broken build or a non-functioning product is almost eliminated – making it easier for the Scrum Master and product manager to assess, limit, and manage risk. Return on investment. Upper management wants to know if the new product or feature will be a success and with an agile management approach, this can typically be answered within a two or three-week cycle. Teams are working towards a finished product or feature in every sprint or iteration, this supports a saleable product much more frequently than the old-school waterfall approach. Sales and customer support are able to gauge customer reaction much more quickly and product managers can ensure that business value remains top-of-mind with each story and development cycle. Along with these key benefits of agile management are those we touched on earlier: collaborative, cross-functional, communicating teams who are able to respond to change quickly. This all contributes to a better feeling of job satisfaction as well as a greater commitment to meeting the organization goals and customer needs. Of course, agile management does take work and effort and it is up to your agile leadership team to fulfill its key agile management responsibilities. Each of the responsibilities is like a puzzle piece, miss out or lose one piece and the puzzle becomes unsolvable and quickly turns into an exercise in frustration. Represent the vision. The product owner is responsible for representing the product vision to the team. The team cannot be expected to deliver a product without knowing and understanding the driving factors behind the product. Assesses and monitors the ROI. The product owner is expected to know the value and ROI on each product update or feature. This knowledge is used to prioritize work and to manage the product backlog. This requires regular conversations with customers to ensure their needs are being met. Development management. Teams are expected to be self-managing in the sense that they work together to ensure stories are completed and meet the agreed upon level of done. Process and success management. The Scrum Master is responsible for making it easy for the teams to get their work done. This includes eliminating barriers to success, protecting the team from competing external requirements, and keeping the team organized and on-track. The Scrum Master must be in-tune with the team needs and be ready to solve any issues or barriers that occur. Release management. The product owner works with DevOps to manage the release cycle. Effective agile management happens when teams, product owners, product or project managers, the Scrum Master, upper management, and customers are aligned with one common goal – in ensuring the delivery of a high quality product quickly and smoothly. This demands communication, autonomy, trust, collaboration, and flexibility – all fundamentals of successfully managed agile organizations.